Lisa Taylor Austin-Smith, a CFMHE known for her expertise in street gangs, was recently quoted in an article on the street gang recruitment of youth who immigrate illegally into the United States. Read the article here. NBFE is pleased to announce that the Honorable Judge Daniel Wilensky has been named the newest member of NBFE's advisory board. 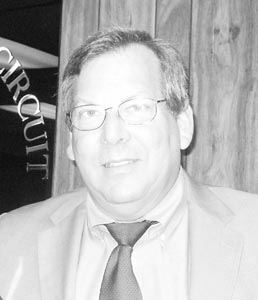 Judge Wilensky serves in the 4th Judicial Circuit in Florida. Read more about him here. The Honorable Judge Daniel Wilensky receiving his "Advocate of the Year" award in 2010. The National Board of Forensic Evaluators (NBFE) commends Michael Holler, a Licensed Mental Health Counselor in Florida, for his successful advocacy for fair access to psychological tests in Florida. Michael and his attorney filed a petition for a declaratory statement to Florida's Board of Clinical Social Work, Marriage & Family Therapy, & Clinical Social Work (a.k.a. the "491 board") on 6/24/16. The petition asked the board to clarify whether Licensed Mental Health Counselors (LMHCs) can administer psychological tests. The board denied Michael's request on 9/6/16. At first glance, this would seem to be a defeat for those advocating for fair access to tests, but an exploration of the board's reason for the denial reveals an important success for counselors, social workers, and marriage and family therapists who conduct forensic mental health evlauations. The Board reasoned that Florida statutes clearly indicate that the practice of mental health counseling in Florida "includes methods of a psychological nature used to evaluate, assess, diagnose, and treat emotional and mental dysfunctions or disorders..." In other words, because the law is already clear on the ability of LMHCs to conduct psychological tests, there is no need for a declaratory statement. 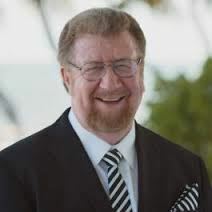 Michael is the Past President of the Florida Mental Health Counselors Association (FMHCA), and was the 49th evaluator to earn the Certified Forensic Mental Health Evaluator (CFMHE) credential in the U.S. He was also among the first group of CFMHEs to earn NBFE's Certified Child Custody Evaluator (CCCE) credential. He took it upon himself to advocate successfully for fair access to tests in Florida, and we commend him for it. Read the details of the Board's declaration here. View NBFE's analysis and position paper on the question of whether or not licensed counselors can administer and interpret psychological tests here. Our position is based on four premises: (1) Counselors have always been experts in testing; (2) Testing is within the scope of practice of counselors; (3) Counselors meet the standards of test manufacturers; and (4) It is impractical and unethical to prohibit counselors from administering and interpreting tests. The counseling profession began in the late 1890s and early 1900s. The first professional counselors were vocational guidance counselors who specialized in the administration and interpretation of various tests, including intelligence and aptitude tests. We believe Newsome & Gladding (2014) put it well when they wrote that the first counselors “quickly embraced psychometrics to gain a legitimate foothold in psychology” (p. 7) . Counselors have continued to administer and interpret such tests up to the present day. There is a consensus within the counseling profession that testing is within the scope of practice of professional counselors. The eight common core areas represent the foundational knowledge required of all entry-level counselor education graduates. Therefore, counselor education programs must document where each of the lettered standards listed below is covered in the curriculum. The National Board for Certified Counselors (NBCC) is the first and largest certifying body in the United States for professional counselors. The credential NBCC has established for clinical mental health counselors is Certified Clinical Mental Health Counselor (CCMHC). In order for this credential to be awarded to a counselor, the counselor must have been educated on the administration of psychological tests . In addition, counselors must pass the National Clinical Mental Health Counseling Examination (NCMHCE), which includes test items on the administration of psychological tests for purposes of assessment, diagnosis, and treatment planning . The American Counseling Association (ACA) is the largest association representing counselors in the United States. The ACA identifies “the administration of assessments, tests, and appraisals” as a primary component of the scope of professional counseling. The ACA’s most recent Code of Ethics refers repeatedly to the ability of counselors to administer and interpret tests, provided that counselors are appropriately trained in the tests they utilize. The American Mental Health Counselors Association (AMHCA) is a division of the ACA that exclusively represents clinical mental health counselors. AMHCA’s published standards for clinical mental health counseling clarify that mental health counselors are expected to be trained in clinical assessment and testing. Like the ACA, AMHCA’s 2015 Code of Ethics refers to the ability of counselors to administer and interpret psychological tests provided that counselors are appropriately trained. Licensed counselors meet the criteria for the highest qualification levels of the three most popular psychological test distributors in the United States. Level C is the highest qualification level established by Psychological Assessment Resources (PAR). This level of qualification requires “an advanced professional degree that provides appropriate training in the administration and interpretation of psychological tests, or license or certification from an agency that requires appropriate training and experience in the ethical and competent use of psychological tests.” Because licensed counselors must have a minimum of a Master’s degree, which is an advanced professional degree, and because CACREP- and CACREP-equivalent counselor education programs require training in the administration and interpretation of psychological tests, licensed counselors meet PAR’s criteria for qualification level C and are commonly certified as such by PAR. Similar to PAR, Pearson Clinical drafted a Level C qualification policy for tests administered in the category of clinical psychology requiring that evaluators earn a “doctorate degree in psychology, education, or closely related field with formal training in the ethical administration, scoring, and interpretation of clinical assessments related to the intended use of the assessment OR licensure or certification to practice in your state in a field related to the purchase OR certification by or full active membership in a professional organization (such as APA, NASP, NAN, INS) that requires training and experience in the relevant area of assessment.” At first glance, readers may deduce that Pearson Clinical requires test administrators to earn a doctoral degree. However, Pearson emphasizes the word “or” repeatedly in their policy through bold print and/or capitalized letters to denote that an evaluator need only meet one of the listed criteria. Because licensed mental health counselors are licensed, and in some cases certified, to practice mental health counseling in their respective states, the second criterion should be met by all licensed mental health counselors. In addition, some counselors will meet the first and third criteria depending on education level and association membership. Western Psychological Services (WPS) provides two advanced qualification levels. Level C permits an evaluator to purchase “all products except advanced psychiatric instruments and advanced neuropsychological instruments” and requires evaluators to have “a master’s degree (MA, MS, MSW, CAGS) in psychology, school counseling, occupational therapy, speech–language pathology, social work, education, special education, or related field.” Again, licensed mental health counselors meet this criterion because they hold master’s degrees in a related occupation. Level N is the highest level designated by WPS, allowing purchase of all tests. This level requires “a doctoral degree (PhD, PsyD, MD) in psychology or related field or MA (psychologist, social worker) a master’s degree (MA, MS, MSW) in fields listed above and at least a weekend workshop on neuropsychological assessment.” Many but not all licensed mental health counselors will meet these guidelines. Specifically, counselors who hold a doctoral degree in a related field meet the criteria, as well as master’s-level counselors who have completed at least a couple days of additional training in neuropsychological evaluation. PREVENTING COUNSELORS FROM ADMINISTERING AND INTERPRETING PSYCHOLOGICAL TESTS WOULD BE IMPRACTICAL AND UNETHICAL. The demand for evidence-based practices and treatment approaches continues to rise in the United States. Third party payers and authorities in the behavioral healthcare sector continue to appply pressure to providers to offer evidence substantiating diagnoses and treatment methods, as well as efforts to measure response to behavioral health interventions. Increasingly, testing provides an integral source of data to comply with these standards of care. Testing aids counselors in formulating a diagnosis, planning treatment, and measuring client progress. According to the Centers for Medicaid and Medicare Services, counselors comprise the largest percentage of the U.S. behavioral healthcare workforce in the National Provider Identifier database, which all healthcare providers are required to register with in order to accept insurance. To deny the largest sector of the U.S. behavioral healthcare workforce the opportunity to administer and interpret psychological tests is illogical. It implies that licensed mental health counselors are qualified to treat mental disorders but not to diagnose them nor evaluate the efficacy of their treatment approaches. This practice is akin to expecting a physician to diagnose and treat hypertension without allowing the physician to measure a patient’s blood pressure. Counselors cannot be expected to treat what they cannot objectively diagnose or measure. Ultimately, such a practice would negatively impact client care. Thus, NBFE views any efforts to restrict the rights of counselors from administering and interpreting psychological tests as potentially harmful to clients and therefore unethical. The National Board of Forensic Evaluators calls on state legislatures, licensing boards, and authorities in all disciplines of the mental health profession to advocate for laws, rules, and policies that protect the rights of all appropriately-trained licensed mental health professionals to administer and interpret psychological tests. We also encourage licensed mental health counselors to seek ongoing training in this area that exceeds the that which they received in graduate school. Counselors should abide by ethical guidelines that require that they be appropriately trained on any test they administer. The National Board of Forensic Evaluators (NBFE) is a 501(c)(3) not-for-profit organization dedicated to providing quality training and certification of all licensed mental health professionals (e.g., counselors, social workers, marriage and family therapists, psychologists, psychiatrists) in the specialty area of forensic mental health evaluation. NBFE is a proud partner of the American Mental Health Counselors Association and several other state, local, and international organizations in the mental health field. To learn more about NBFE, visit www.nbfe.net. Position paper authored by Aaron Norton, Executive Director of NBFE, edited by Dr. Norman Hoffman, President and Founder of NBFE, and approved by the NBFE Board of Directors 8/15/16. National Fair Access Coalition on Testing (n.d.). The National Fair Access Coalition on Testing Mission. Retrieved from http://www.fairaccess.org/home.html. Newsome, D.W. & Gladding, S.T. (2014). Clinical Mental Health Counseling in Community and Agency Settings (4th ed.). Boston: Merrill. CACREP (2016). 2016 CACREP Standards. Retrieved from http://www.cacrep.org/section-3-professional-practice/. NBCC (2016). Certified Clinical Mental Health Counselor. Retrieved from http://www.nbcc.org/Certification/CertifiedClinicalMentalHealthCounselor/. NBCC (2016). Content covered in the NCMHCE. Retrieved from http://www.nbcc.org/InnerPageLinks/ContentCoveredInTheNCMHCE. ACA (2016). Endorsed scope of practice for professional counseling. Retrieved from https://www.counseling.org/about-us/about-aca/aca-media-center. ACA (2014). 2014 ACA Code of Ethics. Retrieved from http://www.counseling.org/docs/ethics/2014-aca-code-of-ethics.pdf?sfvrsn=4. AMHCA (2016). AMHCA Standards for the Practice of Clinical Mental Health Counseling. Alexandria, VA: AMHCA. AMHCA (2015). Code of Ethics. Retrieved from http://www.amhca.org/?page=codeofethicsia. 20/20 Task Force (2013). Meeting notes from Delegates meeting. PAR (2012). Qualification levels. Retrieved from http://www4.parinc.com/Supp/Qualifications.aspx. Pearson (2016). Clinical Psychology Qualifications Policy. Retrieved from http://www.pearsonclinical.com/psychology/qualifications.html. American Psychological Association (2014, September). 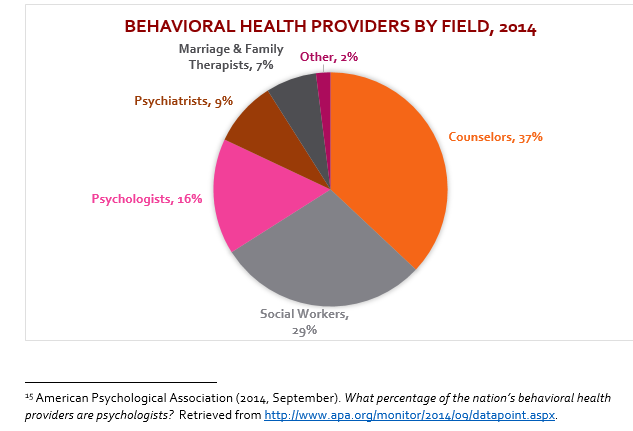 What percentage of the nation’s behavioral health providers are psychologists? Retrieved from http://www.apa.org/monitor/2014/09/datapoint.aspx. Psychological forensic evaluations have long fallen under the domain of psychiatrists and psychologists, and credentialing bodies have catered to these professionals in providing the necessary training and certification. As a result, more than 200,000 licensed mental health professionals (excluding psychiatrists/psychologists) in the United States have been virtually shut out of this interesting and potentially quite profitable niche of the mental health field. Recognizing this, the American Counseling Association and the National Board of Forensic Evaluators have formed a partnership to provide a credible and professionally recognized forensic training/certification process for licensed counselors and other mental health professionals. "NBFE was officially established in 2003 and originated from a specialty certification training program developed by licensed mental health professionals, physicians and practicing family attorneys," said Norman Hoffman, a licensed marriage and family therapist, mental health counselor, certified assessor for the Florida State Department of Children and Families, and president of NBFE's advisory board. Other board members include licensed marriage and family therapists, attorneys, licensed mental health counselors, licensed social workers, licensed psychologists, certified assessors by the Department of Children and Families, clergy, physicians and certified hypnotherapists. NBFE purpose, Hoffman said, is to enhance skills of licensed mental health professionals who, traditionally, have not been recognized in the forensic arena by the public or private sector. "This really is going to be a growing field for counselors," he said. "Especially because, more and more, the mental health field is diminishing as HMOs require more work for less money by practitioners." Mental health professionals in the forensic arena don't deal with insurance companies, Hoffman said, noting that the field can be "quite lucrative." What's more, since he entered the forensic arena, he has seen the scope of his practice expand exponentially and finds his work more fulfilling - so much so that he now devotes 90 percent of his time to forensic work. "The legal community will also be delighted by the addition of counselors to the pool of potential forensic evaluators," Hoffman said. "Lawyers are looking desperately for people who can offer expert psychological testimony." psychology accredited by the American Psychological Association, Canadian Psychological Association or other programs meeting designated criteria specific to psychologists. Similarly, he said, in order to become a forensic psychiatrist, one must first become a board certified psychiatrist, graduate from medical school, perform a year-long internship and meet other closely related regulations that are governed by criteria specific to psychiatry. Before the establishment of NBFE, according to Hoffman, the only way for counseling professionals to obtain forensic credentials was through suspect organizations "that basically would credential anybody." As a testament to the rigors of NBFE's credentialing process, ACA recently went public with its endorsement of the program and has formed a partnership with the group. One of the benefits of this arrangement is that ACA members will receive a reduced rate on the cost of the training/certification process. ACA members are eligible for a 40 percent discount when applying for NBFE credentials as a Forensic Psychological Evaluator. This represents a savings of $320 off the cost of the application and written and oral exams. In addition, for those members who become NBFE credentialed as a Forensic Psychological Evaluator, ACA will grant 15 CEUs (15 contact hours) toward license and/or certification renewal. "We are really excited about this partnership," said David Kaplan, associate executive director for professional affairs at ACA. "It opens up a whole new niche for professional counselors." "Testifying in court as an expert witness has, until now, been the realm of the psychologist and psychiatrist," Kaplan continued. "But with the excellent training opportunities and credentialing process offered by NBFE, counselors will also be able to provide this service." "We view this as one more valuable service we can offer our membership," Kaplan added "ACA members can become certified to offer this new type of service while saving nearly three times the cost of their annual membership." "The partnership with NBFE gives ACA members one more opportunity to specialize and pursue an alternative interest," said Samuel Gladding, ACA president. "And in this current climate of legal proceedings many of which surround issues related to counseling, "this specialized' training will enhance both the skills and reputation of counseling professionals." According to Hoffman, in order to attain NBFE board certification as a Forensic Psychological Evaluator, ACA members and other applicants must meet the following eligibility requirements: a completed application and processing fee; a minimum of a state license/certification to practice mental health counseling, marriage and family counseling, social work, or a related license or certificate approved by the state's licensing board to practice psychotherapy; and a minimum of three years of post-licensed/certified experience. Applicants must also have completed a minimum of 40 hours of substantiated documentation in classes, workshops, seminars, supervision, published professional works, etc., focusing on forensic psychological assessment, sexual offenders, domestic violence, expert witness, ethical issues, fan1ily law, introduction to essentials of forensic assessment, child custody evaluations, assessment in personal injury, malingering, competency to stand trial, civil comn1itment, juvenile justice and substance abuse. Hoffman noted that experience in providing expert testimony, depositions, divorce and fan1ily mediation, competency evaluations will be considered, if there is a verifiable case number and court reference accompanying the application. In addition, those seeking certification must have three professional references who can validate the their ethical and moral standards as well as pertinent clinical skills and abilities. Upon meeting these qualifications, a written examination will be required to assess the depth and breadth of the candidate's forensic knowledge. Upon candidacy eligibility and payment of examination fees, a comprehensive study guide will be provided by NBFE. A practice sample review and oral examination will complete the certification process. In addition to establishing the partnership with NBFE that qualifies ACA members for the discount, Hoffman noted that ACA has recognized and approved NBFE's workshops and home studies for its members. NBFE is part of the Counseling and Psychotherapy Center (CPC), which is approved by the Board of Clinical Social Work Marriage and Family Therapy and Mental Health Counseling as a provider of continuing education. As such, Hoffman said, "We maintain the highest level of expertise and professionalism." The senior clinicians at CPC researched and developed all program materials, according to Hoffman. He noted that CPC ensures the integrity of the programs and considered the level of the needs of the target audience in developing appropriate educational goals and learning objectives. The courses of study meet the high-quality standards required for continuing education for clinical social workers, marriage and family therapists and professional counselors. CPC clinicians have provided face-to-face seminars and workshops for years, Hoffman said, but they are now focused on bringing the training to the practitioners. "While CPC will maintain the faculty and resources necessary to assist its students in developing and enhancing their capabilities, skills and effectiveness in their chosen professions, we have also made it possible, through homestudy, to serve the continuing educational needs of the licensed working professionals," he said. In addition, Kaplan noted that arrangements are underway for NBFE to offer a two-day workshop prior to the ACA convention in Atlanta this coming April. ACA members who participate will be awarded 15 contact hours. A written exam will be offered on the second day. Hoffman admits that the field of forensics is not for everyone. He anticipates that between 5 and 10 percent of counseling professionals might have an interest in going to court. "It takes a real 'Type A; personality," he said. "You've got to have an interest in how the legal system meshes with the mental health profession and enough control of your ego that you are not so tied to one way of looking at things." "Good verbal skills are also essential," Hoffman added. "You're performing (for) a whole new audience, and you must be able to articulate clear thoughts without resorting to a lot of psychobabble." Another big difference between forensic and more traditional mental health practice is the limited scope of the evaluations. "There is a limit on the involvement with the individual," Hoffman said. "For the purposes of the court, you are there to extract as much psychological information as possible. So while you use the same counseling skills (that you have always used) to make that connection, once you have gathered enough information to make an evaluation, your involvement is over." Because of this, Hoffman said, it's much less draining on the counselor particularly those who have been prone to what he terms "compassion fatigue." "Counselors, especially those in private practice, are always looking for new ways to market their services as well as to round out their practices," Kaplan said. For those who meet the criteria, he said, forensic work could be just the ticket for achieving this. "Forensics is still very new to most. ACA members," noted Gladding. "But this partnership may create an interest. It really opens up a door for the counseling profession." Counselors who are interested in learning more about becoming a forensic evaluator can go the NBFE website at www.nbfe.net or contact Hoffman via e-mail at nbfe@nbfe.net. The nation’s largest forensic expert college will sell its forensic accounting division, following a series of investigations by ProPublica and Frontline. by Leah Bartos, Special to ProPublica April 11, 2014, 12:22 p.m.
Reason has a summary of Maye's case. Police mistakenly knocked down Maye's door in a bungled search for a drug dealer who lived in am adjacent part of the duplex. Maye, not realizing it was police knocking down his door, shot and killed one of the officers. He was subsequently convicted of first degree murder and sentenced to death, though his latest appeal removed him from death row. It was a police foul up that put them in Maye's house that night, and as people have noted, if officers had accidentally killed Maye it's unlikely any of them would have gone to prison, much less death row. Wikipedia has more. What Can We Do to Stop the Growth of Mass Shooting?